Anyone who loves movies has a few he or she loves unconditionally to the point that traditional criticism goes right out the window. Master director Robert Altman’s quirky noir, The Long Goodbye, is a cult classic that I’m such an adoring fan of that I probably love it as much for its faults and oddities as its outright strengths. Set in “modern-day” 1973 Los Angeles, The Long Goodbye is ostensibly a hardboiled detective thriller starring Raymond Chandler’s iconic P.I. Phillip Marlowe, with a screenplay adaption credited to Leigh Brackett (The Big Sleep). But you’d never expect Altman to make a straight genre picture, and Elliott Gould is not an actor anyone but the maverick director would think of as Marlowe. The first ten minutes of The Long Goodbye devotes itself to Marlowe’s late night trip to the supermarket to feed his finicky cat sending the clear message that this isn’t going to be your father’s Phillip Marlowe mystery. However, by movie’s end that meandering beginning comes into sharp focus; Marlowe ultimately can’t be fooled by the fictions put before him any more than his discerning feline. This movie is among the very best examples of Altman’s style as substance, full of screwball characters, Vietnam-era cynicism toward authority and plenty of dark, smartass humor. The widescreen cinematography and incessant camera movement emphasize altered perspectives and reflections that symbolize how Marlowe sees different layers from different angles to eventually figure out what’s going on. The smoky theme song, written by John Williams and sung by Johnny Mercer, is beautifully and purposely anachronistic; it’s an artifact from a bygone era like Marlowe himself. One of the movie’s best gags is that nearly every piece of music heard throughout the film is a different arrangement of this theme (even the doorbells and Mexican funeral dirge at the end! ), which further underscores Altman’s approach of working with classic film noir elements but setting them to his own eccentric cinematic rhythm. Marlowe as reimagined by Altman and Gould is a chain-smoking throwback the pair dubbed “Rip Van Marlowe,” and indeed Gould plays him like he’s just woken up from a long sleep as a stranger in a very strange time and place, muttering much of his dialog to himself as he winds his way through this maze of early 1970’s LA. In addition to Gould’s strong offbeat performance, the great Sterling Hayden is larger than life as a rugged, hard-drinking Hemingway-esque writer at the center of the mystery and Henry Gibson is at his smarmy best as a “doctor” running a shady alcohol treatment facility. But the bolt of lightning in this movie’s performances is Mark Rydell, a director of note (The Rose and On Golden Pond), who gives a bone-chilling turn as crime boss Marty Augustine, a psychopath who oozes malice from every pore of his body but speaks and acts with disconcerting calm and deliberation (it’s not a stretch to see an homage to Augustine in Christopher Walken’s menacingly articulate gangster from True Romance). The faults of the movie are easy to spot. It’s a big leap that a jaded P.I. like Marlowe would think nothing of driving a friend who’s clearly been physically fighting with his wife to Mexico in the early morning hours, no questions asked on the long drive, and most audience members will probably see the red herring and the end game a lot sooner than Rip Van Marlowe. But that’s all missing the point. This is not a movie that’s about connecting the right dots along the outlines of the plot, it’s about all the delicate coloring and shading in between those broader lines. The Long Goodbye is exhilarating for the freedom it shows in all of its odd choices in the same way a great improvisational jazz arrangement breathes new life into a standard we’ve heard a thousand times. And it has a shocking bitter ending that is no less jarring than Chinatown’s, yet again carves its own path in being so strangely jubilant in spite of how rotten what we’ve just seen is at its very core. At the end of the day it’s really not ok with Marlowe! The Long Goodbye’s cinematography is legend for cameraman Vilmos Zsigmond’s “flashing” of the original camera negative, a process that involves exposing the film’s negative to additional amounts of light after shooting and before development, altering the contrast and softening aspects of the image. These were pre-digital days so messing around with a feature film’s original negative required a high degree of confidence and testicular fortitude on the part of both Altman and Zsigmond who had teamed up and employed the technique successfully on McCabe and Mrs. Miller. On the upside flashing imparted McCabe with a gorgeous sepia-toned pastiche appropriate for a period Western, and in The Long Goodbye the technique adds an artistic haze to the image that underscores the themes that Marlowe can see but can’t quite make out what’s going on around him and is a man out of time in early 1970’s Los Angeles. However, this analog-era technique also pushes the grain threshold, and seemingly makes contrast levels even more of a moving target as Zsigmond applied differing percentages of flashing to different reels. Not surprisingly both of these movies are a challenge to transfer to digital video. The poor, uneven results of this Kino Lorber Blu-ray reflect that. While some of the bright interiors and outdoor daylight shots rise to the level of passable high-def, lower-lit interior and especially nighttime shots are some of the worst I’ve seen on Blu-ray. The living grain of the film elements in many nighttime sequences just looks like digital noise and hash, and is very distracting. In addition, dirt and other artifacts are consistently visible making it appear that no heroic (expensive) restoration or cleanup was done here and leads me to further speculate that a theatrical print may have been the source of this transfer. The mono sound unfortunately is no better. Harsh and tinny, it kept me reaching for the remote in a constant battle between hearing the dialog (which consistently exhibits hissing and rustling artifacts suggesting the use of lapel mics on the actors) and having the brittle score and sound effects hammer my ears. The music score especially deserved better. The extras include great interviews with Altman, Elliot Gould and cinematographer Zsigmond ported over from a 2002 DVD release. These extras are terrific even in standard def, but a worthwhile postscript to The Long Goodbye’s legacy would have been interviews with current filmmakers inspired by this movie and Altman’s work in general. 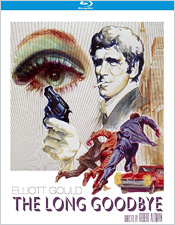 Re-watching The Long Goodbye today it’s apparent that the Coen Brothers and Quentin Tarantino, among others, are fans. Alas, there’s nothing of the sort on this Blu-ray. To be fair, expertly transferring inherently difficult material like The Long Goodbye to HD video would be a time-consuming, expensive job best left to a big studio or an outfit like Criterion. I was hoping for more from this Kino Lorber Blu-ray because I love this movie, but that was probably unrealistic. Regardless of the reasons, this is a missed opportunity.